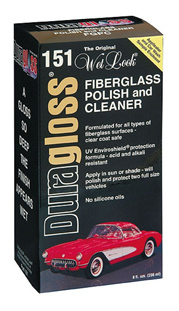 Duragloss FGPC (Fiberglass Polish & Cleaner) contains synthetic polymers, which form a protective coating on the surface of painted vehicles. It is durable to both acid and alkaline washes. Can be applied in the sun or shade to the entire vehicle before removing easily for a "wet look" shine and protective coating.